With the increasing awareness of emission reduction, the development of renewable energies takes over the spotlight from the petroleum industry. 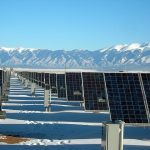 The spectrum of renewable energy businesses now includes not only energy generation and energy saving but also energy storage system, and certain countries have drawn up related subsidy policies for energy storage system. According to EnergyTrend research, energy storage system will first be adopted in emergency power systems, and will make its way into households to lighten the burden during daytime peak hours, which is expected to remarkably propel battery industry’s growth. Even though the electric vehicle (EV) industry has a high demand for batteries, with inefficient infrastructures for EV and related industries still developing, EV will not see a wide adoption for at least another five years. On the other hand, rechargeable battery can be not only incorporated in other renewable energy applications but also be used as emergency power system. Therefore, the market outlook is looking up. 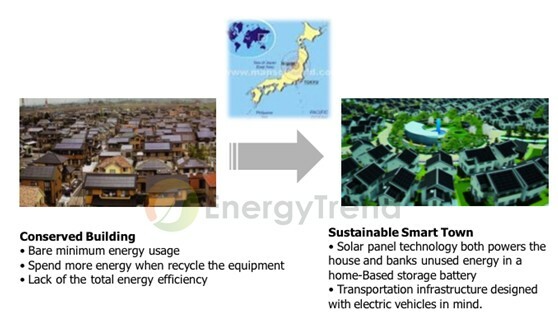 According to Japanese government’s Ministry of Economy, Trade and Industry’s predictions (Photo I), the global demand for energy storage system is climbing due to the rise of smart city. For example, Japan has been more proactive about adopting renewable energies in city reconstruction after the earthquake. Japan’s green energy market is expected to see a booming growth starting from 2012, and the same is expected to happen for other major countries in five years. As the name suggests, “emergency storage power” is power storage for emergency use. Thus, in the beginning, the products make “economical” as their first priority. However, now the use is no longer merely for energy storage. In livelihood and industrial sectors, energy storage is used for other purposes. In the industrial sector, the main use is to assure the computers have enough time to turn off in order to minimize the automated production loss during the power down process. Currently most manufacturing equipment has energy storage system. Moreover, as far as base station is concerned, an independent power liberates it from the issue of limited coverage. In addition, in the rising cloud computing industry, due to the high electricity consumption of servers, energy storage system can not only provides emergency power, but also optimize the conversion rate through the configuration of distributor and battery. As a result, the company can save the cost for thermal dissipation stemming from low electrical efficiency. 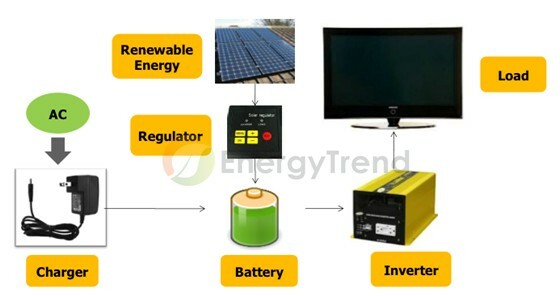 In the livelihood sector, energy storage system is mostly incorporated in residential buildings due to their relatively low electricity consumptions, which makes energy storage systems more applicable in that area. On the other hand, commercial buildings’ electricity consumptions are higher and require the power to be ready at all times. As a result, the commercial buildings mostly use fossil-fuel power stations as their sources of emergency power. If energy storage system solely focuses on emergency power, it will prevent it from reaching wide adoption in the livelihood sector. Therefore, the manufacturers start to change the energy storage system designs, aiming to increase its economical benefit in between peak and off-peak hours. The goal is to make energy storage system for not only emergency usage but also energy-saving purpose. 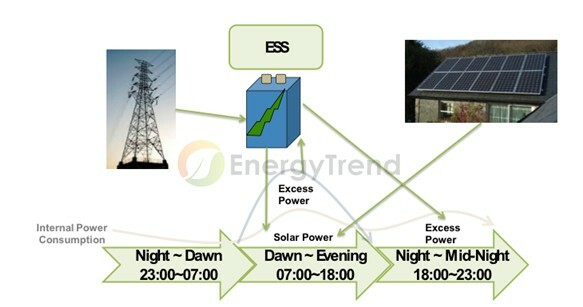 For instance, Photo II indicates that the energy storage system can connect with the power grid and provide for the electricity needs between peak and off-peak hours. Also, the system can use green energies as energy source and bring a independent and environmentally-friendly edge. In the past, a new renewable energy system usually consisted of energy saving and power generation applications (LED street lamp with solar power system, for example). More often than not, energy storage system’s importance was overlooked, so much so the companies often adopted low-efficiency lead acid battery. Renewable energy can make a good match with high-efficiency rechargeable battery. However, as most solar systems are grid-connected, the current power grid is not suitable for a system of large electricity regeneration, not to mention that recycle rate during voltage changing is not ideal. Thus, large solar systems are usually built near the power plant to avoid interferring other power systems. In fact, solar energy, LED and battery are all powered by direct current. Therefore, a system consists of power generation, energy saving and energy storage modules can optimize the electricity efficiency. However, in consideration of power generation cost and electricity transmission, most electricity sources are still from alternating current. For this reason, it is very rare to find a power system with all three modules in the major cities, while deserted places will adopt the aforementioned power system for the sake of convenience. Power independence is a pressing issue for Japan, especially so after the Japan earthquake in 2011. The nuclear crisis made the Japanese government start emphasizing on the practical applications of renewable energies. 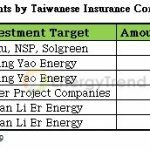 The government even planned on close down all the nuclear power plants in 1Q12, which indicates that solar power will become the main electricity source in the future. 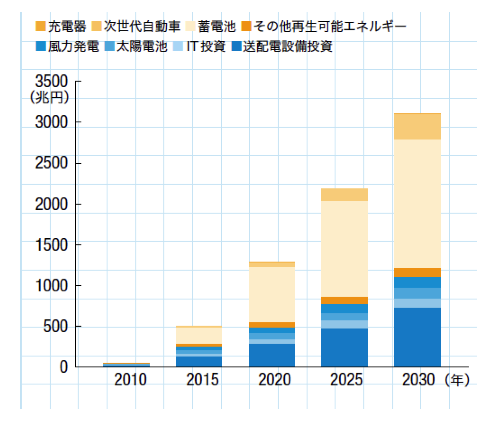 At present, Japan’s annual solar demand is 3.6GW, and the government aims to increase it to 28GW by 2020 (Photo IV). As opposed to the United States’ centralized generation, Japan’s solar energy supply is distributed generation. The trait of distributed generation is that it does not transmit the electricity long distances; instead, the electricity is used where it is generated. Thus, it is doable to promote the solar systems and energy storage systems to households. In the past, the renewable energy system was usually adopted in stand-alone buildings, because their space and square measure were more flexible. However, the old power system is hard to be altered largely. Hence, it makes adopting renewable energy more difficult. But with the right design of power system in the new buildings, renewable energy’s edge of being independent energy will shine. Furthermore, the power system can be designed to supply the energy needs of a town: the unused electricity of households can supply the area which needs electricity. Given the current economy outlook in Japan, it will be a challenge to integrate the solar system with energy storage system, because the rechargeable battery module’s cost takes up more than 50% of the total cost. The economy will play a key role in this issue. With the efforts of former Prime Minister of Japan Naoto Kan, the Japanese government started subsidizing battery usage from late 2011. The subsidies beneficiaries include personal user/personal legal entity and legal entity. 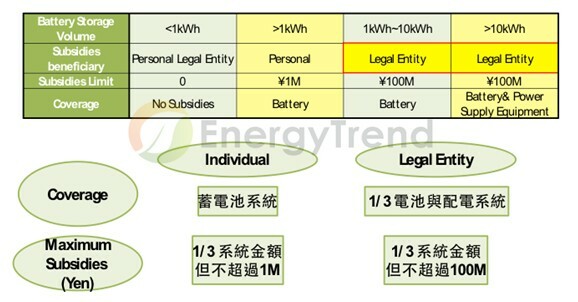 As for the former, the subsidies limits differ depending on the battery storage volumes (1kWh to 10kWh), and the subsidy amount can not exceed one third of the total cost or JPY 1 million. As for the latter, the subsidies limits vary as well. For 1kWh-10kWh, the subsidy amount can not exceed JPY 1 million or one third of the total cost; for >10kWh, due to the complications cost of electricity transmission, the subsidy not only covers battery but also other components. The high subsidy attracts attention from quite a few companies. However, Japan holds higher standards for the products – the life span has to be more than five years, and it also has specific requirements for product efficiency. Therefore, it will be a tough challenge for Taiwanese makers to make their way into the supply chain. The focus of global battery industry has been gradually shifting from high portability to energy efficiency. Given that that consumer-based market has reached saturation, household market is a new battlefield for energy storage systems.